Many athletes attribute their success on the field of play to the support system that they get either from their families or friends. Such goes a long way in pushing the athlete to do better and produce his or her best performances. Plateau United star Ogene Elijah has that kind of system him in Jos but just not the conventional family type support. He has a fan group that he says have been his pillar of support and any time he is on the pitch, he gives his all-knowing fully well that he has them in his corner. His support group isn’t the usual fan group or family group but an unusual one that brings the term ‘support’ into a whole different light. Plateau United’s Matchday 1 fixture against FC Ifeanyi Ubah at the New Jos Stadium had a brilliant back story to it. It wasn’t even about the goalless draw but the beautiful sight of Ogene’s supporters. 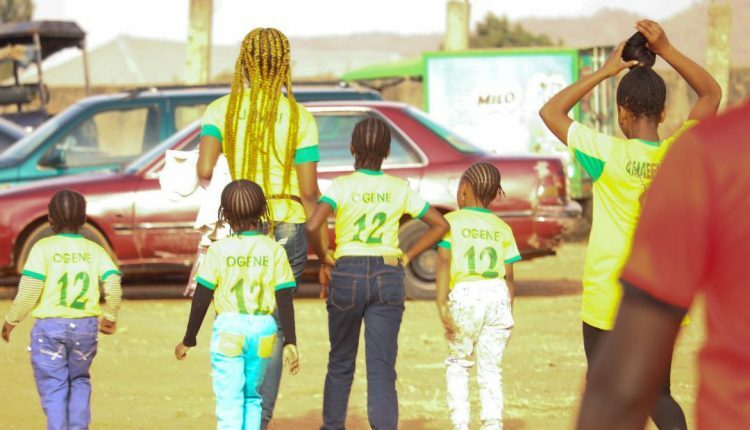 Two ladies and a few kids all adorned in Plateau United kits with the Ogene’s name on their replica kit was a sight to behold. The kids and ladies who wore this were full of dancing before and after the game. They indeed caught the eye of many with their stylish dance steps and songs rendered extolling the midfielder’s virtues. It was obvious the kids were having the fun of their lives at the stadium as one of the ladies who brought them to the stadium attested. “I decided to bring the kids to the stadium so that they can watch their uncle play. Ogene is like an uncle to them, and even though they know he is a footballer, I felt they needed to see him play live,” Jennifer Oguama, who escorted the kids to the stadium told npfl.ng. In an era fans are beginning to return to arenas around the country to watch games, it is refreshing to see little kids supporting their favourite footballer while having fun at the same time. Ogene Elijah moved to Plateau United in 2017 from Sunshine Stars of Akure and won the league same year which endeared him to supporters of the club. He became a cult hero in the area he was resident and slowly built up a following. Among his followers were young kids whom he regales with stories about his football exploits. Ogene became friends with virtually everyone in his neighbourhood and it was from there it all started. The adults were always at his games to support and when the kids asked if they could join up, Ogene didn’t hesitate to make sure it happened. Those people you saw at the game are my neighbours where I live in Jos. They are all here to support me. It all started when I came to Plateau United in 2017. They have been supporting me so I decided to deck them up in jerseys with my name on it,” he revealed. “I’m humbled by their love for me. They always follow up on my games and they have been waiting for Sunday’s game for a long time because they missed the league a lot. “I was downcast because of the result but they came up to me and told me to cheer up that there will be better days ahead. There can’t be any better support than that. Right now, everyone on my street has my jersey. I’ve made sure they got one and I’m really particular about the little kids. I’m happy they are interested in me and the league as well. It is good to catch them young. Plateau United’s season didn’t start on a good note but that didn’t dampen the enthusiasm of Miss Oguama who said she will continue taking the kids to the stadium and will support Ogene and Plateau United. “I love football and Plateau United is my favourite club. Going to watch football games has been my hobby since I was a child and I’m happy the kids have taken an interest in the league too,” she enthused. The kids had fun on Sunday and can’t wait for the next game. We danced and had fun. We will continue to take the kids to Plateau United’s home matches and I hope we win the title this season. The kids are really happy the league is back and I’m sure they can’t wait for the next home game. Surely Ogene has a good support system that can only spur him to greater heights and with the kids dancing and chanting his name at Plateau United’s home games, it can only get better for the former Sunshine Stars man.